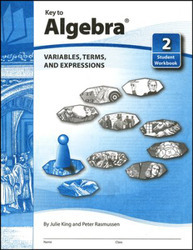 In Key to Algebra new algebra concepts are explained in simple language, and examples are easy to follow. Word problems relate algebra to familiar situations, helping students understand abstract concepts. Students develop understanding by solving equations and inequalities intuitively before formal solutions are introduced. Students begin their study of algebra in Books 1-4 using only integers. Books 5-7 introduce rational numbers and expressions. Books 8-10 extend coverage to the real number system.